Chapter XIV Of the Consecrations: With an Account Of the Nature and Nurture Of the Magical Link. These, as initiates of the VII Degree of O.T.O. are aware, mean more than appears. Writers of Magick have been unsparing in their efforts to instruct us in the preparation of the Will, but they seem to have imagined that no further precaution was necessary. There is a striking case of an epidemic of this error whose history is familiar to everybody. I refer to Christian Science, and the cognate doctrines of “mental healing” and the like. The theory of such people, stripped of dogmatic furbelows, is perfectly good Magic of its kind, its negroid kind. The idea is correct enough: matter is an illusion created by Will through mind, and consequently susceptible of alteration at the behest of its creator. But the practice has been lacking. They have not developed a scientific technique for applying the Will. It is as if they expected the steam of Watts' kettle to convey people from place to place without the trouble of inventing and using locomotives. The mirror may be distorted, dull, clouded, or cracked; and to this extent, the reflection of ourselves may be false even in respect of its symbolic presentation. In that Light, therefore, all that we do is to discover ourselves by means of a sequence of hieroglyphics, and the changes which we apparently operate are in an objective sense illusions. But now observe how the question of the Magical Link arises! No matter how mighty the truth of Thelema, it cannot prevail unless it is applied to any by mankind. As long as the Book of the Law was in Manuscript, it could only affect the small group amongst whom it was circulated. It had to be put into action by the Magical Operation of publishing it. When this was done, it was done without proper perfection. Its commands as to how the work ought to be done were not wholly obeyed. There were doubt and repugnance in FRATER PERDURABO's mind, and they hampered His work. He was half-hearted. Yet, even so then intrinsic power of the truth of the Law and the impact of the publication were sufficient to shake the world so that a critical war broke out, and the minds of men were moved in a mysterious manner. The second blow was struck by the re-publication of the Book in September 1913, and this time the might of this Magick burst out and caused a catastrophe to civilization. At this hour, the MASTER THERION is concealed, collecting his forces for a final blow. When The Book of the Law and its Comment is published, with the forces of His whole Will in perfect obedience to the instructions which have up to now been misunderstood or neglected, the result will be incalculably effective. The event will establish the kingdom of the Crowned and Conquering Child over the whole earth, and all men shall bow to the Law, which is “love under will”. Many ends, many means: it is only important to remember the essence of the operation, which is to will its success with sufficiently pure intensity, and to incarnate that will in a body suitable to express it, a body such that its impact on the bodily expression of the idea one wills to change is to cause it to do so. For instance, is it my will to become a famous physician? 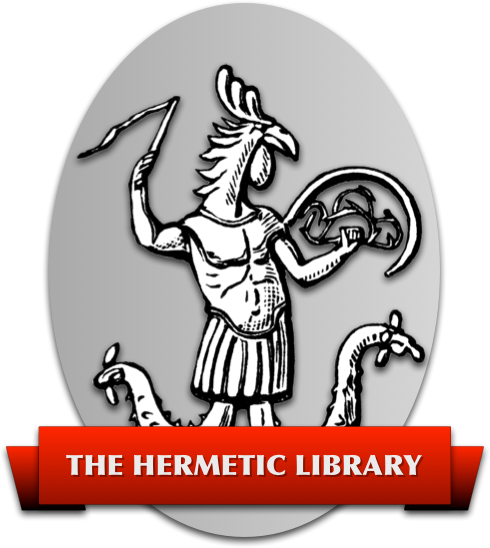 I banish all “hostile spirits” such as laziness, alien interests, and confliction pleasures, from my “circle” the hospital; I consecrate my “weapons” (my various abilities) to the study of medicine; I invoke the “Gods” (medical authorities) by studying and obeying their laws in their books. I embody the “Formulae” (the ways in which causes and effects influence disease) in a “Ritual” (my personal style of constraining sickness to conform with my will). I persist in these conjurations year after year, making the Magical gestures of healing the sick, until I compel the visible appearance of the Spirit of Time, and make him acknowledge me his master. I have used the appropriate kind of means, in adequate measure, and applied them in ways pertinent to my purpose by projecting my incorporeal idea of ambition in a course of action such as to induce in others the incorporeal idea of satisfying mine. I made my Will manifest to sense; sense swayed the Wills of my fellowmen; mind wrought on mind through matter. I did not “sit for” a medical baronetcy by wishing I had it, or by an “act of faith”, or by praying to God “to move Pharaoh's heart”, as our modern mental, or our mediaeval, mystic, miracle-mongers were and are muddlers and maudlin enough to advise us to do. It is only necessary to inflame the Will to the proper pitch and to issue its commands; they are instantly obeyed, unless — as in the case of organic disease — the apparatus is damaged beyond the art of Nature to repair. It may be necessary in such a case to assist the internal “spirits” by the “purification” of medicines, the “banishing” of diet, or some other extraneous means. But at least there is no need of any special device “ad hoc” to effect contact between the Circle and the Triangle. Operations of this class are therefore often successful, even when the Magician has little or no technical knowledge of Magick. Almost any duffer can “pull himself together”, devote himself to study, break off a bad habit, or conquer a cowardice. This class of work, although the easiest, is yet the most important; for it includes initiation itself in its highest sense. It extends to the Absolute in every dimension; it involves the most intimate analysis, and the most comprehensive synthesis. In a sense, it is the sole type of Magick either necessary or proper to the Adept; for it includes both the attainment of the Knowledge and Conversation of the Holy Guardian Angel, and the Adventure of the Abyss. I may work “naturally” by wooing, of course. But, magically, I may attack her astrally so that her aura becomes uneasy, responding no longer to her lover. Unless they diagnose the cause, a quarrel may result, and the woman's bewildered and hungry Body of Light may turn in its distress to that of the Magician who has mastered it. These “natural” cases may be transposed into subtler terms; for instance, one might master another man, even a stranger, by sheer concentration of will, ceremonially or otherwise wrought up to the requisite potential. But in one way or another that will must be made to impinge on the man; by the normal means of contact if possible, if not, by attacking some sensitive spot in his subconscious sensorium. But the heaviest rod will not land the smallest fish unless there be a line of some sort fixed firmly to both. But, “as a Mystic”, he knows that all things are phantoms of One Thing, and that they may be withdrawn therein to reissue in other attire. He knows that all things are in himself, and that he is All-One with the All. There is therefore no theoretical difficulty about converting the illusion of a clear sky into that of a tempest. On the other hand, he is aware, “as a Magician”, that illusions are governed by the laws of their nature. He knows that twice two is four, although both “two” and “four” are merely properties pertaining to One. He can only use the Mystical identity of all things in a strictly scientific sense. It is true that his experience of clear skies and storms proves that his nature contains elements cognate with both; for it not, they could not affect him. He is the Microcosm of his own Macrocosm, whether or no either one or the other extend beyond his knowledge of them. He must therefore arouse in himself those ideas which are clansmen of the Thunderstorm, collect all available objects of the same nature for talismans, and proceed to excite all these to the utmost by a Magical ceremony; that is, by insisting on their godhead, so that they flame within and without him, his ideas vitalising the talismans. There is thus a vivid vibration of high potential in a certain group of sympathetic substances and forces; and this spreads as do the waves from a stone thrown into a lake, widening and weakening; till the disturbance is compensated. Just as a handful of fanatics, insane with one over-emphasised truth, may infect a whole country for a time by inflaming that thought in their neighbours, so the Magician creates a commotion by disturbing the balance of power. He transmits his particular vibration as a radio operator does with his ray; rate-relation determines exclusive selection. In practice, the Magician must “evoke the spirits of the storm” by identifying himself with the ideas of which atmospheric phenomena are the expressions as his humanity is of him; thus achieved, he must impose his Will upon them by virtue of the superiority of his intelligence and the integration of his purpose to their undirected impulses and uncomprehending interplay. All such Magick demands the utmost precision in practice. It is true that the best rituals give us instructions in selecting our vehicles of force. In 777 we find “correspondences” of many classes of being with the various types of operation, so that we know what weapons, jewels, figures, drugs, perfumes, names, etc. to employ in any particular work. But it has always been assumed that the invoked force is intelligent and competent, that it will direct itself as desired without further ado, by this method of sympathetic vibrations. We see, then, that we can never affect anything outside ourselves save only as it is also within us. Whatever I do to another, I do also to myself. If I kill a man, I destroy my own life at the same time. That is the magical meaning of the so-called “Golden Rule”, which should not be in the imperative but in the indicative mood. Every vibration awakens all others of its particular pitch. When Frater I. A. was in danger of death in 1899 e.v. Frater V. N. and FRATER PERDURABO did indeed invoke the spirit Buer to visible manifestation that the might heal their brother; but also one of them furnished the money to send him to a climate less cruel than England's. He is alive to day7); who cares whether spirits or shekels wrought that which these Magicians willed? Let the Magical Link be made strong! It is “love under will”; it affirms the identity of the Equation of the work; it makes success Necessity. The Hebrew legends furnish us with the reason for the respective virtues of water and fire. The world was purified by water at the Deluge, and will be consecrated by fire at the last Judgment. Not until that is finished can the “real ceremony” begin. These may now advantageously be replaced by (a) “… pure will, unassuaged of purpose, delivered from the lust of result, is every way perfect.” (CCXX, I, 44) to banish; and (b) “I am uplifted in thine heart; and the kisses of the stars rain hard upon thy body.” (CCXX, II, 62) to consecrate. For the Book of the Law contains the Supreme Spells. This passage must not be understood as asserting that the Universe is purely subjective. On the contrary, the Magical Theory accepts the absolute reality of all things in the most objective sense. But all perceptions are neither the observer nor the observed; they are representations of the relation between them. We cannot affirm any quality in an object as being independent of our sensorium, or as being in itself that which it seems to us. Nor can we assume that what we cognize is more than a partial phantom of its cause. We cannot even determine the meaning of such ideas as motion, or distinguish between time and space, except in relation to some particular observer. For example, if I fire a cannon twice at an interval of 3 hours, an observer on the Sun would note a difference of some 200,000 miles in space between the shots, while to me they seem “in the same place.” Moreover, I am incapable of perceiving any phenomenon except by means of the arbitrary instruments of my senses; it is thus correct to say that the Universe as I know it is subjective, without denying its objectivity.